On May 14 and 15 we visited CODOS sites at Hoosier Pass, Loveland Pass, Berthoud Pass, Willow Creek Pass, and Rabbit Ears Pass to assess current conditions. We observed nothing unexpected, events have been transpiring as we have reported, informed by our visits in March, April, and unfolding weather conditions. Mainly, dust conditions have been solidly in the "Average" category statewide essentially since D5 occurred on April 12, and in the Southern Basins since late March/early April when D3/D4 occurred. Within this "Average" categorization, conditions are largely consistent in severity at the Front Range and Northern CODOS sites, and also as observed at high elevations. Higher elevations show pronounced dust coverage mostly on lee aspects and areas where the wind would be expected to subside and allow the dust to be deposited. Spring weather occurring after April 1 added a nice boost to Central and Northern Colorado Basins resulting in peak SWE occurring well into April, but the Gunnison and Southern Basins largely missed out on these events and saw peak SWE occurring very near April 1. The Central and Northern Basins benefited not only from the additional precipitation but accompanying short-term albedo resets. Nonetheless the below average snowpack, dust conditions, and lack of notable spring storms mean Northern and Central Basins are on track to see SNOTEL melt out 2 - 3 weeks early than usual. On May 15 we also made our usual observations at Swamp Angel Study Plot. The snow depth sensor reports no snow as of May 16 at 1 pm. As of May 14, snow profiles still show about 15" snow depth and 5.5" of SWE. It has been an amazing, massive melt period in the San Juans since our last storm occurring May 1 -2 (we have not received precipitation at Senator Beck since May 2). From May 8 - May 14, we lost 7.5" of SWE, that is over 1" SWE a day. SNOTEL stations in the Animas/San Juan/Dolores/San Miguel are within a day or two of reporting snow-all-gone, at least 21 days earlier than the median date. In the Rio Grande, Wolf Creek SNOTEL in a 10 day period (May 3 - May 12) lost 12.3" of SWE, that is 1.23" SWE/day. SNOTEL stations in the Rio Grande are showing snow-all-gone as of a few days ago, 41 days earlier than the median date. Streamflows have kept up a steep rising limb across the state, most notably in the Southern Basins, in response to the rapid snowmelt. This has tapered off in the last couple days with cloud cover and a depleting snowpack in general is manifested. There is still snow in the San Juans to be melted (please see pictures below), the location of which is creeping up in elevation plus some northerly aspects. 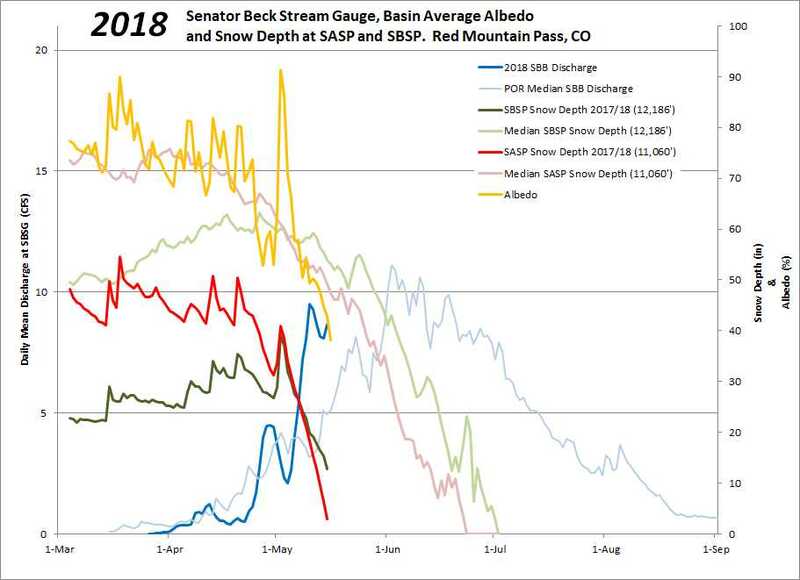 I plan to report more on this in a future Update (it was already introduced in the March 9 Update), but generally within a few days, when snow is gone from SASP is when 50% of cumulative streamflow from March 1 - June 30 has passed through the Senator Beck stream gauge. And we are very near that point when snow is considered gone at SASP. Please see plots, pictures, and more comments/observations below. Albedo at Swamp Angel has taken a nose dive with snow cover depleting rapidly. Senator Beck Study Plot has retained a little more snow than Swampy since May 2, but given its elevation (12,200') is melting quickly as well. The forecast is sunny and above freezing temperatures until the weekend when chances of precipitation come into the picture. At 1 pm on May 16 snow depth under the sensor at Swamp Angel reported 0. Senator Beck Study Plot shows 12" of snow remaining. 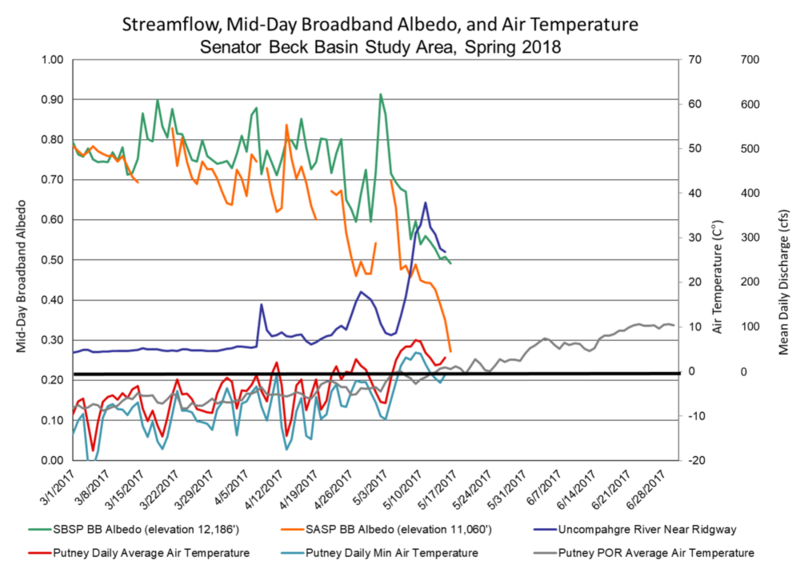 Streamflow took a short timeout from its upward trajectory in response to a couple days of improved albedo and cooler weather. We have not seen precipitation since May 2. Have we seen peak discharge at Senator Beck? Good question. I would not be surprised to see a higher peak given the clear and warm forecast the next couple days, and considering the amount of snow still remaining in the Basin. Please see pictures below of Senator Beck Basin. If it does not happen in the next few days, the inclement weather predicted over the weekend will likely slow down melt rates and resultant streamflow. Snow cover is nearly gone at SASP. 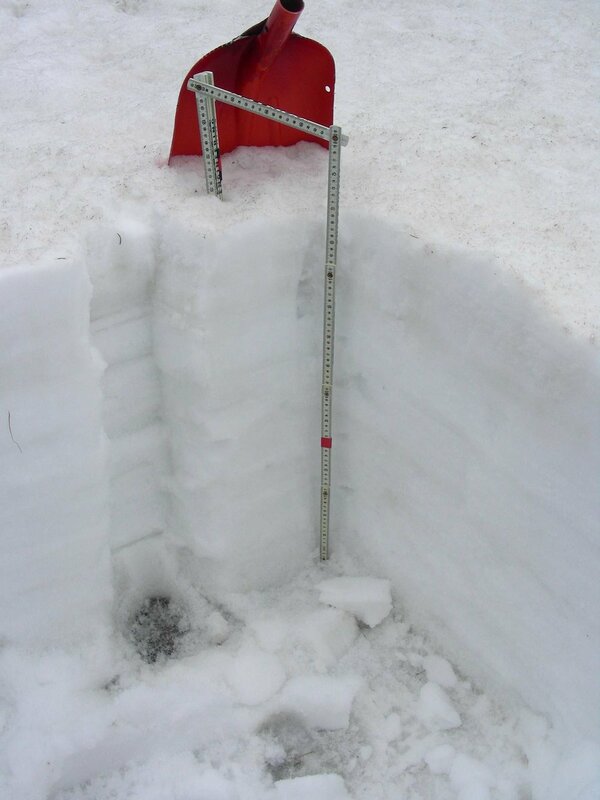 Where the snow profiles are conducted snow depth is currently around ~9". From May 8 - May 14, we lost 7.5" of SWE, over 1" SWE a day. May 14 at Swamp Angel. Snow sensor reported 0" of snow depth on May 16 at 1 pm. Although, there is still some snow yet to be melted. Photo showing Swamp Angel and northerly aspects that still have snow. Shallow snow pit shows snow remaining at Swamp Angel. All layers merged samples were collected on this day (May 14). Clean snow exposed to highlight dirty snow. Senator Beck stream gauge. Stream still has snow/ice covering sections of stream that formed in early winter. We are entering an active weather pattern but beneficiaries will be more eastern and northern areas of Colorado. Snow Profile at Hoosier Pass, May 14, 2018. SWE is 10.7". All dust layers at surface. Hoosier Pass. Contrast between dirty snow surface and clean snow underneath. Hoosier Pass. Where there is snow at higher elevations, dust is easily visible in depositional areas. Snow profile at Grizzly Peak. 10.6" of SWE. As elsewhere, all dust at surface. Looking up valley towards Loveland Pass from sample site. View towards A-Basin ski area from top of Loveland Pass. View towards the northwest from Loveland Pass. Berthoud Pass snow profile, May 14, 2018. SWE is 13.9". Snow profile with SNOTEL in background. Willow Creek on May 14, 2018. Snow all gone at sample site. Forested areas retain some intermintent snow. Picture of high country from Willow Creek Pass sample area. Looking south from Willow sample area. Intermittent snowcover in treed areas. Rabbit Ears snow profile. SWE is 19.4". View of snow pit and surrounding landscape at Rabbit Ears Pass. Clean snow block in foreground to show contrast with dirty snow surface at Rabbit Ears.